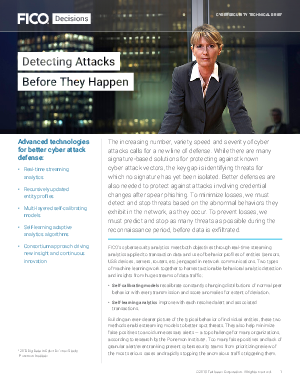 The increasing number, variety, speed and severity of cyber attacks calls for a new line of defense. While there are many signature-based solutions for protecting against known cyberattack vectors, the key gap is identifying threats for which no signature has yet been isolated. Better defenses are also needed to protect against attacks involving credential changes after spear phishing. To minimize losses, we must detect and stop threats based on the abnormal behaviors they exhibit in the network, as they occur. To prevent losses, we must predict and stop as many threats as possible during the reconnaissance period, before data is exfiltrated. Learn how technologies such as AI, self-calibrating models and self-learning analytics are being used to detect cyber attacks before they happen.